Calling all vintage Chanel fans! Join Christina of Designer Vault on Thursday, November 20th as she unveils some of the most unexpected and rare vintage designer pieces in honor of Promises2Kids charity. Promises2Kids creates a brighter future for foster children in San Diego. Since 1981, Promises2Kids has lead the fight against child abuse, providing support, hope and opportunities for fostered youth. Shop a beautiful collection of Chanel, Hermes and more - all for a good cause! 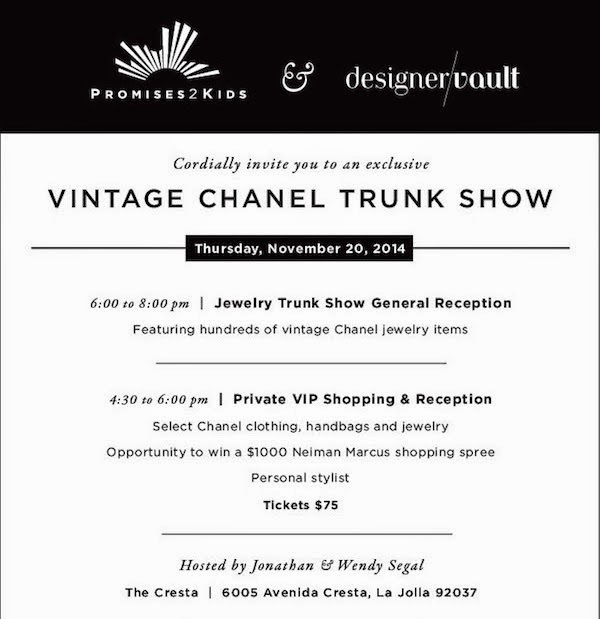 10% of sales from the Vintage Chanel Trunk Show will benefit Promises2Kids. Plus, you'll have the opportunity to win a $1,000 Neiman Marcus shopping spree! For more information contact Sandra Taylor at Sandra@promises2kids.org or 858-278-4400.